In May 2011, Bank Negara Malaysia had announced that they will introduce a new series of banknotes in order to replace the current design that has been in circulation for around 15 years. The most highlighted part of the announcement is the re-introduction of the RM20 note, which was not included in the third series. The design of the new notes was announced on December 21, 2011, and the notes are expected to be put into circulation in the second half of 2012. The new series banknotes are legal tender and will co-circulate with the existing series. The existing series will be gradually phased out. All banknote denominations in the new series will retain the portrait of the first Seri Paduka Baginda Yang di-Pertuan Agong, Tuanku Abdul Rahman ibni Tuanku Muhammad. The banknotes are supplied by Crane AB of Sweden, Giesecke & Devrient GmbH of Germany, Oberthur Technologies of France and Orell Fussli of Switzerland. They were put into circulation on July 16, 2012. Tuanku Abdul Rahman with the national flower, hibiscus, and patterns of the traditional fabric - the songket. Mount Kinabalu and pinnacles rock formations of Gunung Api valley. A replacement banknote is a banknote that is printed to replace a faulty one and is used as a control mechanism for governments or monetary authorities to know the exact number of banknotes being printed. 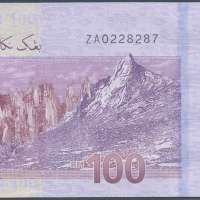 As quality control finds defective notes in the printing process after the serial number has been overprinted, they are taken out with their serial number written down and replaced with another banknote printed specifically for this purpose, so that the number of banknotes being printed stays the same in each production batch. This saves time and money compared to re-printing exactly the same serial number that was used before. It is rare that the replacement banknote has the same serial number as the original faulty one. A replacement note will have its own serial numbering system that separates it from the normal numbering system. Malaysia uses "Z" in the serial number to mark replacement banknotes.